A critically acclaimed film that won a total of eight 1970 Academy Awards (including Best Picture), Patton is a riveting portrait of one of the 20th century's greatest military geniuses. One of its Oscars went to George C. Scott for his triumphant portrayal of George Patton, the only Allied general truly feared by the Nazis. Charismatic and flamboyant, Patton designed his own uniforms, sported ivory-handled six-shooters, and believed he was a warrior in past lives. He outmaneuvered Rommel in Africa, and after D-Day led his troops in an unstoppable campaign across Europe. But he was rebellious as well as brilliant. As Patton shows insight and poignancy, his own volatile personality was one enemy he could never defeat. In my youth, I used to have a serious bias against "older films" and even though 1970’s Patton isn't all that old, I pretty much plopped any film I couldn't remember from its theatrical run into that category. (I was three when Patton hit the screens.) Patton was one of the first movies to show me what narrow-minded bonehead I was. (Lawrence of Arabia sealed the deal.) I always envisioned these older movies as being stilted, dull affairs, but those two films clearly demonstrated how wrong I was. Lawrence of Arabia is maybe the best historical film ever made but Patton isn't far behind. While Lawrence is the better film, I think Patton qualifies as the superior biography simply because I feel it remains truer to its subject. Lawrence clearly takes many licenses with the facts, whereas Patton sticks closer to reality. 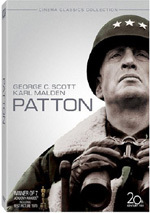 George C. Scott's career-defining performance as General George S. Patton remains key to the success of this film. Scott had many successes before and after Patton, but it remains the role for which he will be best remembered. He won - and famously refused - his Oscar for it, and it's an absolutely perfect performance. He completely loses himself in the part and he's able to draw a solid picture of the man. Scott's work in this film stands out not just for 1970 but for all film acting. It's one of those performances that will always be held up as a model. Also very good is Karl Malden as General Omar Bradley. To be frank, I always found Malden's Bradley to be just a little too genial and sweet, something that I couldn't help but feel was influenced by the fact that the real Bradley served as a consultant for the film. I'm not saying Bradley wasn't really a good guy, but I simply get the feeling that some rough edges may have been smoothed out because of his involvement. It's much easier to be blunt with historical characters when they're dead – or at least when they don’t act as consultants on the films in question. Nonetheless, the Bradley character works well to illustrate the foibles of Patton and neatly shows the different ways that officers could do things. Bradley's simple, folksy way contrasts neatly with the harsh egotism of Patton, and the differences heighten our awareness of Patton's flaws, so while Bradley does seem a bit too soft, this method nonetheless works well in the interest of the story. Franklin Schaffner directs the film in a fairly workmanlike manner. He lacks much flair, but he tells the story efficiently, effectively and without unnecessary sentimentality. Some of the battle scenes fall a little flat - a relatively early engagement in North Africa seems to drag – but since the film really isn't about fighting, that's not a significant problem. While it'd be nice if Schaffner could portray war in the visceral and kinetic manner Steven Spielberg demonstrated in Saving Private Ryan, I'm happy to note that he is able to avoid Spielberg's overwrought sentimentality and his tendency to telegraph all of his points. Schaffner occasionally betrays some bias during the movie, but Patton really appears remarkably free of any particular ideological taint. It's a film that can easily be claimed for either hawks or doves. Individual interpretations of Patton as a man and as a warrior are wide open. Take the "slapping" scene, for example. Does this depict a cruel, insensitive man who views his underlings as nothing but pawns in his struggles for power or does it show a man with a strong sense of morality, purpose, and conviction? Neither side is right or wrong. It's all in the interpretation, something that happens frequently in this film. More than 35 years after its release, Patton remains a classic. The movie boasts excellent production value along with a stellar performance from its lead. War movies don’t get much better than this. 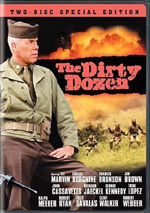 Patton appears in an aspect ratio of approximately 2.35:1 on this single-sided, double-layered DVD; the image has been enhanced for 16X9 televisions. 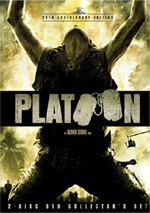 Since the 1999 DVD release of Patton looked pretty solid, I hoped for greatness from this 2006 transfer. Unfortunately, the new version suffered from problems not apparent on the old disc. Sharpness was the major concern found here. The majority of the movie looked soft and mushy. The flick demonstrated a lack of detail most of the time and it felt like it was shot through gauze. Close-ups demonstrated decent delineation, but everything else tended to look indistinct. No issues with jagged edges or shimmering occurred, and only a bit of edge enhancement appeared. Print flaws were minor. I noticed a few streaks and spots but not many faults. Colors also failed to stand out as positive. The hues were usually flat. They lacked the vivacity and dimensionality I expected – and had seen in the past – as they often presented drab, lifeless elements. Some brighter elements occurred, but not many. Skin tones looked off as well; they seemed either too ruddy or too brown. At least blacks were reasonably deep and firm, while low-light shots seemed acceptably smooth. Though a little cleaner than the 1999 DVD, the 2006 transfer was significantly softer and featured less vivid colors. That made it a true disappointment. On the other hand, the Dolby Digital 5.0 audio mix offered minor improvements on the earlier Patton DVD’s 5.1 soundtrack. Why did this one drop the prior edition’s dedicated LFE channel? I have no idea, but the audio didn’t suffer any problems because of it. Both mixes offered similar bass response, as they showed nicely deep, taut low-end material. Both also demonstrated virtually identical soundfields. The soundstage demonstrated surprising width and depth for such an old film. The stereo imaging of the front three channels appeared especially strong. Sounds were nicely placed within that area and they also panned well across the speakers. We even got a lot of accurately localized speech. The surrounds were used sparingly but somewhat effectively. They provided a decent level of ambiance though they rarely attempted more than that. This was fine with me, especially since the front spectrum was so vivid and well-defined. Audio quality seemed perfectly solid for a movie from 1970. Speech demonstrated a bit of edginess, but the lines were intelligible and reasonably natural. Effects also suffered from a modicum of distortion, as explosions and gunfire occasionally became a little rough. I didn’t think these issues were a real problem, though, as the elements were acceptably accurate. The score appeared pretty clean and smooth, and it featured nice dynamics. Ultimately, the sound mix of Patton was quite good for its age. I thought the audio of the 2006 Patton DVD was a little stronger than the 5.1 track on its 1999 counterpart. The main difference related to various forms of distortion. The 1999 mix showed slightly edgier speech and a little more roughness to the effects. The old disc also came with a layer of hiss not present here. These differences weren’t enormous, but they meant the old disc got a “B” for audio opposed to this one’s “B+”. Though the 1999 DVD included some nice extras, the 2006 offers improvements in that area. Almost everything from the old disc appears here along with many new elements. I’ll mark new materials with an asterisk, so if you see a star, it’s new to this set. On DVD One, we find an *Introduction from Screenwriter Francis Ford Coppola. He chats about challenges related to the Patton character, his research and choices, why he was fired from the production, and how its success helped his career. This four-minute and 50-second chat acts as a decent little lead-in to the movie. Coppola also provides an *audio commentary. He gives us a running, screen-specific look at the film. First the bad news: this commentary comes with tons of dead air. This problem intensifies as the movie progresses and leaves us with an awful lot of empty spots. Coppola even acknowledges this; about 70 minutes in, he remarks that doing a commentary for a movie you didn’t direct is like being the commentator for the Rose Parade. That’s not fair, as I’ve heard plenty of good tracks from non-directors – as well as many lousy ones from directors. At least when Coppola does speak, he usually offers decent information. Coppola discusses how he ended up on the project, why he was canned, research, inspirations, and the methods he used to organize his sources. Coppola also goes over creating some of the flick’s most famous sequences like the opening speech, changes made by subsequent screenwriter Edmund North, and what parts of the film are real and which are invented. Coppola manages to present nice details, but the pervasiveness of the dead air makes it a tough listen. When we head to DVD Two, we start with *History Through the Lens: Patton - A Rebel Revisited. This 90-minute and four-second program mixes movie clips, archival materials, and interviews. We find notes from producers/former studio executives David Brown and Richard Zanuck, grandson Robert Patton, cinematographer Fred Koenekamp, aide to General Bradley Chet Hansen, military historian Col. Cole Kingseed, and WWII veteran/author Paul Fussell. We also get some archival footage, most notably a TV appearance by Charles Kuhl, one of the soldiers whose abuse by Patton was depicted in the film. We even hear from Kuhl’s dad as he reads a letter the kid sent to him about the incident. “Rebel” examines the extremely long period it took to bring Patton’s story to the screen, adapting books about the general and dealing with the anti-war climate in the late Sixties, finding a director and casting. From there we learn about locations, issues related to recreating a war, and other production topics as well as its reception and legacy. We find out about fact versus fiction and get biographical notes about Patton as well as some about General Omar Bradley and other figures. Those elements comprise the majority of “Rebel”, and they help distinguish it from the average “making of” program. Fans of the latter genre will get a fair amount of good information in that vein, but biography dominates “Rebel”. It examines Patton’s life within the context of the movie, though, so expect a lot of information about how the two intersect. All of that makes it very compelling. I like the look at omissions from Patton’s career such as the failed “Hamelburg Raid”, and it’s good to see events in a broader context. “Rebel” melds movie making of with standard biography to become a useful program. For the next documentary, we get the 46-minute and 35-second *Patton’s Ghost Corps. In it, we hear from veterans of Patton’s unit who were left behind when he raced to fight the Battle of the Bulge. Recorded in 2004, we hear from Sgt. Harry Francisco, PFC Myron Albert, SSGt. John Milroy, PFC Robert Porter, PFC Harry Helms, Sgt. Jack Kopetz, 1st Lt. Herndon Inge, PFC Bob Kingsbury, Sgt. Ralph Reichley, PFC Richard Kelly, Sgt. Earl Carpenter, SSGt. James Carey, PFC Harold Kane, Sgt. Angelo Brucato, PFC William Foley, Sgt. Bill Peck, PFC Russell Bryant, Sgt. Jack Weakley, Sgt. Fred Nichols, PFC Paul Hemmingway, PFC Doug Benson, 1st Lt. Howard Rives, Sgt. Bill Heinlein, Sgt. Nicholas Viglione, PFC Don Mulry, PFC Oscar McLamb, Chaplain Charles H. Manning, Sgt. Gilbert Kinyon, PFC Roland Sluder, Capt. William Hansel, PFC James Blount, Capt. Robert Cassell, Sgt. Walter Turner and PFC Harry Kirstin. The show examines the events experienced by the soldiers. Left in a holding position, they confront a lack of supplies and a severe German winter. We learn about the Army Special Training Program (ASTP), its dismantling and what happened to its members. We follow their issues and experiences in detail. “Corps” proves quite blunt as it explores its subject. The soldiers tell their stories in detail and don’t hide their emotions. We also get a lot of footage from the period, some of which shows graphic results of warfare. We find outspoken opinions of Patton as well as the ins and outs of the soldiers’ lives. This ends up as a gripping piece of work. DVD Two also contains a good 49-minute and 46-second documentary called The Making of Patton: A Tribute to Franklin J. Schaffner. This piece effectively covers a fair amount of information about the making of the film, though the title is somewhat misleading. It makes it sound as though the program will be a biography of Schaffner, whereas it spends virtually no time discussing his life other than as it related to Patton. The piece provides modern interviews with cinematographer Fred Kroenekamp and composer Jerry Goldsmith. Their comments are combined with 1970 remarks from Schaffner, actor George C. Scott and others and are mixed in with production stills, on set "behind the scenes" footage, and finished film clips. Overall it's a solid though too brief documentary. A film of this scope could have used more time than 50 minutes, but for what we get, it's well presented. Much valuable information about the film's creation is depicted and it maintains a generally entertaining pace. Under “Still Galleries”, we get two elements. *Production Still Gallery Accompanied By Jerry Goldsmith’s Complete Musical Score runs 36 minutes and 20 seconds. Is it just me, or does it seem surprising that the score for a nearly three-hour movie takes up so little time? I guess that's because Goldsmith repeats so many motifs. Next comes a *Behind the Scenes Gallery Accompanied by Audio Essay on the Historical Patton. It lasts 53 minutes and 15 seconds as it presents notes from Patton historian Charles M. Province, the founder of the Patton Historical Society. Province's remarks are quite interesting and informative. He adds a lot of data that isn't covered by the film in that he tells us about Patton's life prior to WWII. Province also clarifies some of the events that are depicted in the film and tells us what really happened, though this doesn't happen much; it seems that the movie was pretty accurate. While I'm sure he worked from notes, it doesn't appear that Province is just reading his comments, which adds a nicely informal quality to his statements. The track offers some solid perspective on the "historical" Patton and whets one's appetite for a full biography. One comment about the two galleries: I didn’t indicate that they appeared on the old DVD because that release failed to present the various pictures. However, both the isolated score and the audio essay were included on the 1999 DVD, so they don’t come with totally new material. The DVD concludes with the movie’s original theatrical trailer. A *booklet completes the package. This includes some good production notes written by Sylvia Stoddard. Since the rest of the set includes so much information, these don’t become essential, but they offer a nice recap of various production issues. The 2006 set loses four radio ads from the prior disc as well as some alternate Goldsmith musical cues. Also absent are the newsreel clips of the real Patton that appeared on the first widescreen laserdisc release (but not the 1997 reissue). I have no idea why these fascinating clips still didn't make the cut. As it stands, Patton is one of the all-time great films, one that fully deserves its continued level of respect. It tells its tale well and benefits from many positive elements. While this new two-disc version includes very good audio and a strong set of extras, the picture quality seems subpar. 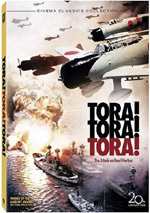 The original 1999 DVD offers superior visuals, as this one appears bland and blurry. That factor makes it tough to whole-heartedly recommend the “Cinema Classics Collection” edition of Patton. I like the new set’s extras and prefer its audio, though the 2006 disc’s sound isn’t a radical upgrade. Unfortunately, the inferior picture quality means the 1999 DVD remains the better one to actually watch.